It’s beautiful outside right now in the Sacramento Valley! But soon winter will be upon us and you may be looking to add in a new workout experience. X-Bike is a great choice whether you are new to fitness, transitioning from outdoor training to indoor training for the winter, or looking for another cross training option. X-Bike is the only indoor cycle that mimics a real bike. It has a free wheel system that works the same as your bike outside; allowing you to stop and start quickly. The unique X-Bars mimic the movement of the handlebars as you are climbing outside. Your core is working to keep your upper body and lower body tied together. When you add all of these features up you get a total body workout that anyone of any fitness level can do. Want a bonus? 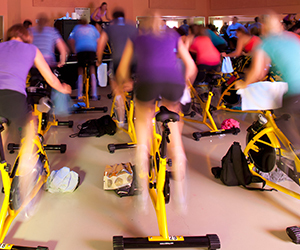 X-Bike burns 50% more calories than a traditional indoor cycle class; up to 500 calories in 30 minutes! Click here to visit our X-Bike schedule. We hope to see you in an X-Bike class soon!